Are you conversant with reliable pet meals that will ensure the fulfillment of all dietary recommendations required for the optimal growth of your pets? Or are you simply looking for the best pet food brands to boost their growth? When it comes to making excellent choices for healthy pet foods, it is not always an easy decision as to which side to glide. By the end of this article we would have satisfactorily answered all your pet food questions and you will get to learn how to pick the appropriate food for your pet. When selecting the best food brands for your pet, unique factors such as the quality of ingredients, well-detailed analysis, and brand history are essential to consider. In this contrast article for Taste of the Wild vs Blue Buffalo, we’ll emphasize on the major differences between them. 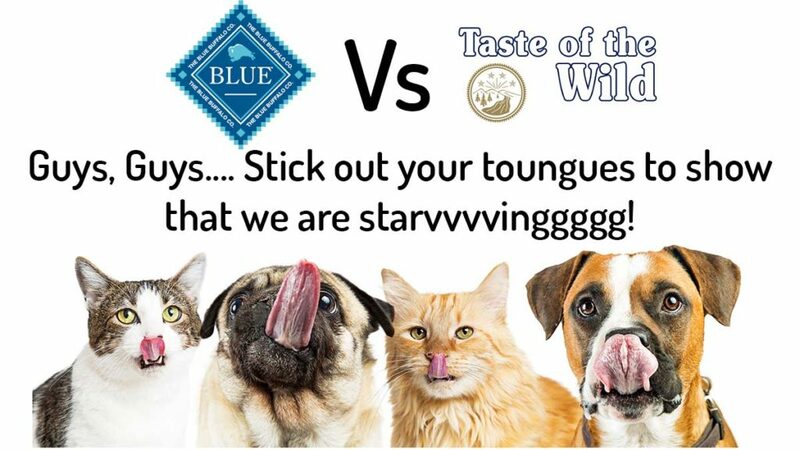 After you are done with this awesome comparison, check out Taste of the wild and and Blue Buffalo here to see the different flavors and pricing. The protein composition of Taste of the Wild are reasonably higher than Blue Buffalo, while Blue Buffalo still maintains standard amounts of protein . Taste of the Wild contains about 3.32% more protein than Blue Buffalo on dry dog food and also higher by at least 5.2% on wet dog food. Taste of the wild is much more affordable than Blue Buffalo, whereas blue buffalo is also one of the most affordable brands in the market. On aggregate, Blue buffalo has more varieties (434 flavored recipes) of wet and dry food for both dogs and cats while Taste of the Wild has just 18 flavors. Blue Buffalo has had more recalls to a total of 9 times while Royal Canin has been recalled 3 times. There are a lot of components that come from specialized dog foods used to maintain weight and enable them grow strong muscles. Peas are controversial ingredients that could cause issues relating to digestion a leading to diarrhea and other digestive system diseases for your pet. Comparing both brands, Blue Buffalo has numerous amounts of food types for dogs and cats. Taste of the Wild (on the other hand) has a limited amount of food types, lacking certain flavors that your pet may already be used to from other brands. The major reason behind selecting popular pet foods according to their nutritional value is to ensure that the health of your pets is sustained. In addition to maintaining a stable and uncompromising immune system in your pets, the nutritious supplements included in Taste of the Wild and Blue Buffalo are essential in supporting your decision to make the right choices for your pet’s dietary plan. The main nutritious components that provide a healthy living in the Taste of the Wild brand as well as Blue Buffalo are: Protein, Fat and Fiber. Notwithstanding the slight difference, it is highly significant for a pet’s balanced diet plan. There is a little difference between the protein component of Taste of the Wild and Blue Buffalo. You can see that Taste of the Wild contributes about 3.32% more protein in their pet food product than Blue Buffalo. On another scale, Blue Buffalo dry cat foods contain 4.12% less protein than Taste of the Wild dry cat foods. In general, Taste of the Wild and Blue Buffalo inarguably contain almost the same amounts of protein. Proteins are essential nutrients that are made up of various types of amino acids including the essentials which pets are unable to synthesize on their own. Since cats and dogs synthesize half of their daily requirements, it is necessary for their pet meals to be induced with high protein supplements to maintain their total nutritional needs. Regular intake sustains muscle build-ups in cats and dogs as well as the regulation of their body tissues. In order to make sure that your pets are looking healthy and vibrant, it is important that you provide adequate protein-enabled meals. Fats are incredible components of a pet’s balanced dietary plan. Inclusive of the energy it provides, fats also function as regulatory supplements that improves the entire development and proper functioning of your pet’s body system. Fats also prevent the unusual growth of infections and pet-prone inflammatory conditions associated with Arthritis. The importance of a proportionate dietary fiber is to ensure that your pets do not experience endless series of digestive malfunction. Fiber enables food digestion, which is usually one of the most frequent health problems in pets. There are many pet food types out there, and as the brands increase so does competitiveness. Certain brands may be more affordable than others and this obviously is an extra advantage especially for a pet owner on a budget. More and more people may prefer to go for a cheaper brand, this is where a price comparison becomes necessary. It may seem difficult or totally impossible to track your expenses – but with our detailed comparison on their prices, you will be able to identify the best possible choices to make when purchasing any of these nutritious foods for your beloved pet(s). The average cost-per-pound (lb) is basically determined by the amounts of moisture present in each of the brand’s pet food products. Preferably, the average cost-per-kilo-calories (kCal) eliminate the influential nature of moisture – thus, becoming a more suitable metric to consider when calculating the average cost of pet foods. So where is the best place to purchase thee brands? Good Question, Overall, chewy.com has the cheapest prices. Its rich nutritious content is made up of natural and appealing ingredients which include Beef, peas, garbanzo beans, natural flavour, tomatoes, blueberries, raspberries, salmon oil (a source of DHA), lamb meal, canola oil, egg product, wild boar, ocean fish meal, pea flour, brewers yeast, tomato pomace, flax seed,salt, dried chicory root, among others. Blue Buffalo provides a nourishing diet with all-natural ingredients. It is a healthy supplement that is garnished with whole grains, fresh vegetables and fruits for flavor. It constitutes a high-protein diet pack such as bacon, chicken, trout, salmon, turkey, and others. Other ingredients are fish oils, potatoes, collated minerals, and life-source minute substances to improve the health situation and vitality of pets. Check out the current Taste of the wild and Blue Buffalo recipe here. Inspired by an excellent idea to recreate an exceptional pet food recipe that will be the best affordable option in the marketplace, the Taste of the wild brand was established and has grown into a renowned industry leader in the manufacturing and distribution of cat food to various continents. Proudly referred to as a ‘family-owned brand’, their major priority has been to seek out more insightful ingredients that will improve the quality of their commodities and expand the lifespan of our pets. Blue Buffalo is indeed a compassionate brand. Once upon a time the founding family started experiencing health-threatening conditions with their pet and that triggered concerns. It was left to the owners to construct a food recipe that would not only improve the health of their canine family member but would ensure a better lifestyle and general wellbeing. Blue Buffalo has been through moments of trial to achieve perfection and these may have led to scars of recalls,that notwithstanding the brand remains a leader in pet food manufacturing and distribution. As natural dog foods, Taste of the Wild and Blue Buffalo are made from high-end formulas. They are both incredible options that you can safely feed your furry pets with. However, with Taste of the Wild’s unique ingredient list, favorable pricing, and other high protein content, it is suggestive that Taste of the Wild has a slight edge over Blue Buffalo. Taste of the Wild is a ancestral-type product using a reasonable amount of regular meat meals as its outright source of animal protein, thus earning a highly recommended product outcome. It is fuelled by the need for pets to obtain high levels of protein through meat, much like their ancestors. If affordability is the theme of your price tag, then Taste of the Wild may be the appropriate brand for you. With varying options (dry and wet), they constitute categories of diverse products. So, just in case you are looking for a brand with more varieties to choose from, Blue Buffalo is the preferred option. It is also noteworthy to remember that pet food varieties are often prioritized according to their nutritional value, mainly in relation to meat content, ratio of fat to protein as well as other essential vitamins and minerals.